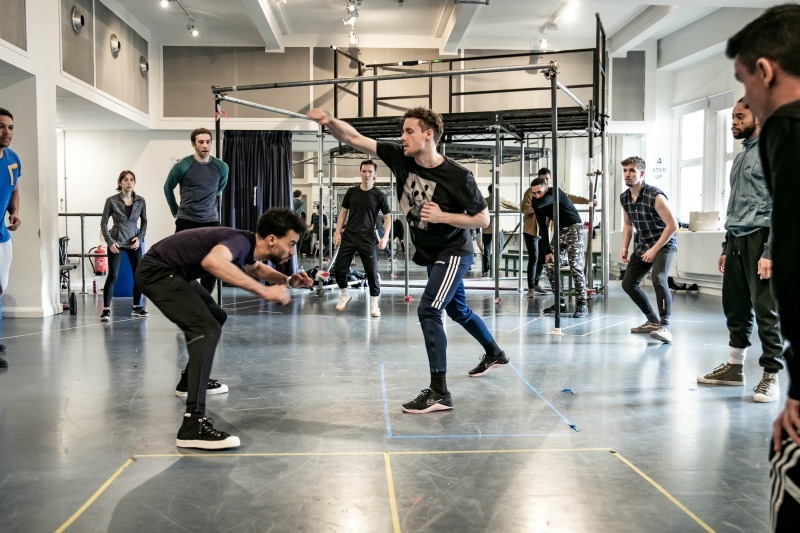 As I mentioned in my first blog, what makes this production of West Side Story so thrilling is that unlike many previous incarnations this particular production will be completely re-choreographed and week 2 and 3 has been spent working on the majority of these movement numbers. In order to completely re-imagine this imperative aspect of the musical we need to understand what made it so revolutionary almost 60 years before. It was this sense of finding a “dance vocabulary” that made his work and subsequently West Side Story so progressive. 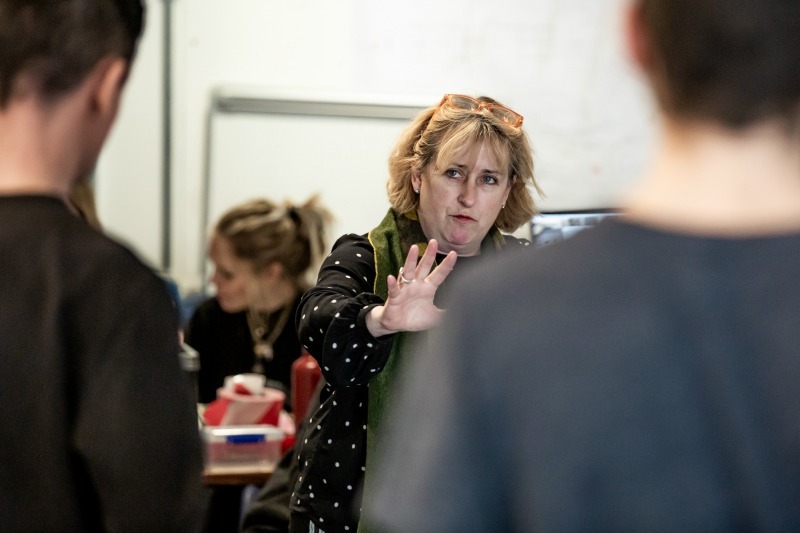 The scene work and dance need to feel they are one entity - they should flow so effortlessly through that an audience should be so involved in the story and the characters that the fact they are dancing should never feel like it stands out. Watching the way Aletta Collins (choreographer) and Sarah Frankcsom (director) work together to create this vocabulary is fascinating. Week 2 begins with working on the Rumble Scene - which is the moment all of the pent-up anger and building tensions of both the Sharks and Jets comes to a climactic end as they both meet under a highway to fight. There’s no denying that the piece is heavily dance based and even when you hear the vocals build: “the jets are going to have their day tonight, the sharks are going to have their way tonight” you get an immediate sense this is a piece that physically needs to move as well as vocally build. However, it has to feel like it’s not detached from the dramatic story telling, because then we as the audience lose that momentum, especially in something like the build up to the rumble. When the vocal element is tightened and refined, we see the full force of the powerhouse that is West Side Story. The rumble is musically written like the build up to something big. The actors need to attack the vocals so specifically - but with a building tension and vocal dynamic that end as both gangs face one another ready to fight. The rhythms are complicated but when the actors nail them it is utterly thrilling and the hairs on your arms stand on end. Aletta begins by setting the scene and laying the markers for the actors and the points they have to hit - but to begin with this is free- she allows the actors to find the moments for themselves before setting anything in stone. The best way to describe it is like watching a painting taking shape - but instead of layers of paint, colour and shade being added, it’s more energy, movement and emotion that start to fill the canvas. This is a great way to work on this type of number as it’s not necessarily a dance number but it still feels it needs movement and this is when we see the “dance vocabulary” being cemented in the narrative. In the beginning of week 3 we revisit the Rumble but this time with the fight director Kevin McCurdy and it’s now we see technical craft and creativeness working together to create a safe but exhilarating rumble. We want the audience to feel like they are watching a real fight that is unpredictable but when there are a lot of bodies on stage and fast physical interaction it has to be very carefully planned and executed. Aletta and Kevin work in tandem with Aletta picking out the key musical moments and beats that the actors should hit. Then Kevin works out a fight combination with the actors to fit the music. As actors your technique is always the foundation to allowing you to execute singing, dance, fight direction safely and with an understanding of how all of the elements come together to allow you to have stamina and longevity throughout not only the length of the show itself, but the whole run. The audience never see this craft or technique - it’s not shown it’s inherent. Observing both creatives working together on the same section with one having the focus on craft and the other creativeness and witnessing this collaboration and the end product it produces, is really special. This rumble is already fizzing and bubbling with tension and excitement and it will only continue to grow as rehearsals progress and I already know that this is going to be just one of many highlights in this earth shuddering production.